A cold glass or can of soda pop is one of life's greatest treasures. Decades ago, people sought out diners to enjoy a delicious glass of carbonation. It was even recommended as a health aid! Fast forward 50 years and science tells us that soda isn't what it's all cracked up to be. In fact, drinking too much can contribute to obesity, diabetes, and a host of other ailments. That bad news is just from regular, sugary soda. When you start diving into the world of diet soda pop, it gets worse. Nowadays, it seems like anything delicious or enjoyable is bad for you. When people start a new diet or begin a weight loss program, it is always strongly suggested that they give up drinking the stuff. After all, one serving of regular soda is essentially needless calories, offering no nutritional benefit. Ingredients in diet soda may cause you to feel hungry, crave sugary snacks, and may mess with your metabolism. However, after drinking soda pop consistently for a long time, it is a huge challenge to stop drinking it completely. Below are my top tips for kicking this habit to the curb once and for all. Most of us consume soda because it contains caffeine, the ultimate life source on our planet. I'm only half joking here. Americans love their caffeine and I'm no exception. Those of us who are in a committed relationship with caffeine know that it doesn't ever want to let us go. This relationship is forever, and if we try to leave, torrential pain and suffering like nothing ever seen before will be unleashed. It's like a bad break-up multiplied by infinity. In all seriousness, the point is you shouldn't stop drinking soda cold turkey if you're drinking it for the caffeine. You could, but the headaches, fatigue, and lethargy will try to knock you down for the first few days, up to a week or so, depending on how much you're consuming. This first tip is pretty common: simply wean yourself off of soda. Cut back gradually each day until your body no longer needs it. Once you get down to your last few days, stop buying it. If you don't have the soda readily available in your refrigerator, you are forced to choose something else. When you are out at a restaurant, choose water, tea, lemonade, your favorite cocktail or brew if appropriate. From experience, cutting your soda habit to "I'll only have soda if I'm eating out at a restaurant," is not a good idea. Going so long without having it, then having a taste while out and about, sets you up for potential failure. You might see your self-control tested, and then failed, when you start craving the soda again. Don't do it. This isn't a kick your caffeine habit article. You most likely will never see such an article from me. I love caffeine and chances are you do too. 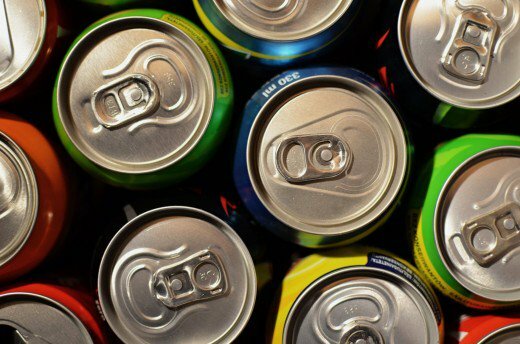 So how can you give up soda and still get your caffeine? Enter tip two: find other sources of caffeine. My number one is coffee. You can tell from all of my bios across social media that I love coffee. I drink mine black. No additives whatsoever. My tagline is, "it's coffee, not dessert." There are many benefits to enjoying black coffee. Number one is no calories and maximum caffeine content. However, black coffee is an acquired taste. Not everyone likes the taste of coffee. Still others can't have black coffee because it's hard on their stomach. I don't see any harm in adding a little milk, sugar, or creamer. I also enjoy a caramel macchiato with an extra shot or two of espresso from Starbucks as an occasional treat. You could also enjoy an iced coffee, cappuccino, latte, there are so many options. Not a coffee person? Try tea. I love Lipton Black Tea. Green tea is also great for energy and boosting your metabolism, among many other health benefits. Switching from soda or coffee caffeine to tea takes time. Tea has less caffeine and offers a slow burn energy versus the jolt that comes from coffee or a can of soda. It can be done, but it is an adjustment. As far as energy drinks go, it's not the best replacement. They are full of sugar and chemicals, almost worse than the soda. I love an ice-cold Red Bull, but it's a once in a while treat versus an everyday supplement. When you are kicking your soda habit, you are most likely also trying to drink more water. The problem with that is plain water is hard to drink. Isn't it strange how drinking a few cans of soda or a few cups of coffee is easy, but trying to drink the same amount of water is like torture and takes all day? Tip three solves that problem: add fruit to your water for a natural and healthy flavor. This is a great way to give your water a little kick and you can customize it to your own taste. Slice lemons, limes, or both and put a few slices right in your cup! Watermelon and strawberries are also delicious in the summer. I love to fill a pitcher with water and add cinnamon sticks and slices of apple. Cinnamon boosts the metabolism, so this is a tasty and healthy combination! There's an entire market dedicated to water additives. These can be helpful to kick your soda habit and increase your water intake. Crystal Light offers many options. I love their strawberry energy packets. They are very sweet, so I can usually get two to three uses out of one packet. Plus it gives a little energy boost to help get through the afternoon slump. MIO is also a favorite of mine. There are many flavors to choose from and they even have a few products with caffeine in them. You can control the amount of sweetness by how many squeezes you use. Sometimes the allure of soda is its fizziness. There's something magical about the fizzle of carbonation and the way it feels on your tongue. If this is something you love, then you can easily replace soda with your choice of carbonated water. Meijer has a delicious brand of strawberry kiwi that my husband and son both love. La Croix is extremely popular and available at most stores. No calories, no artificial sweeteners, and plenty of flavors to choose from make this a prime choice among many health and fitness professionals.